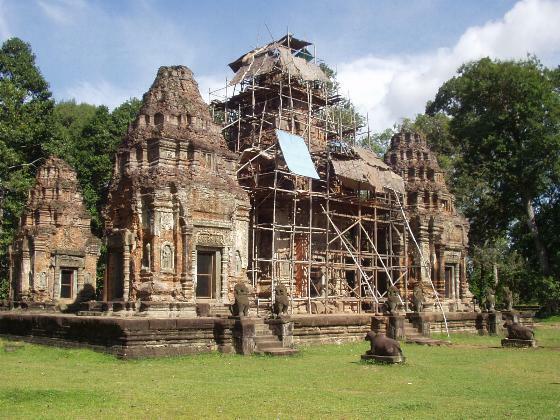 After a brief open-air morning tour around the city, our guide takes us on a drive east of Siem Reap to the most ancient temple sites of the Angkor group that are open to visitors, these being near the modern village of Roluos. 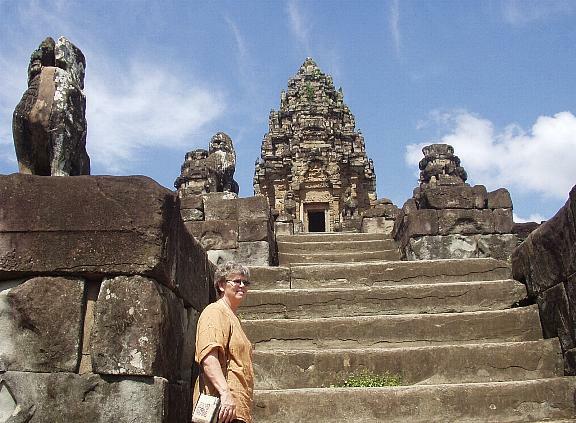 Peg takes an early morning tour around the city near our hotel. 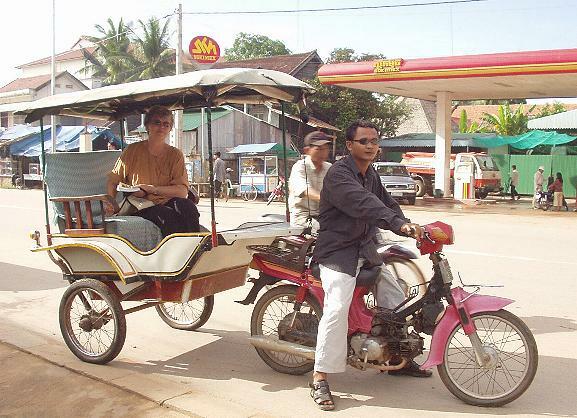 These "motor trailers" are Cambodia's tuk-tuks. This little pig went to market. Note the unique means of transportation. 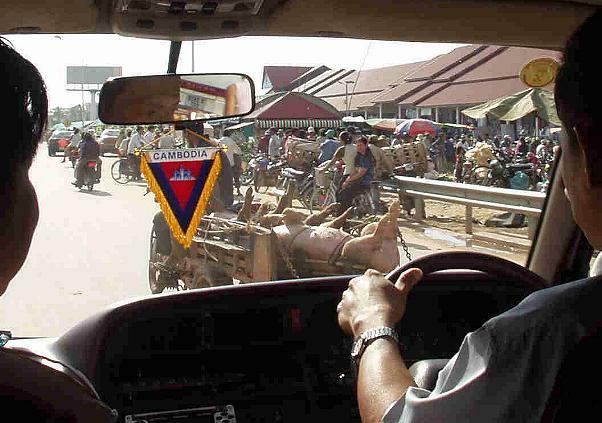 We will devote a separate album to Cambodia's inventive & efficient means of transportation. 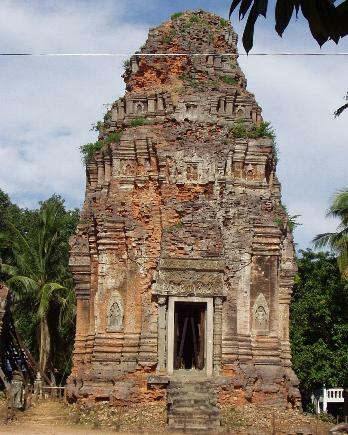 Dating from 893, Lolei temple is one of the 3 earliest extant temples which exemplify the beginning of the classic period of Khmer Art. 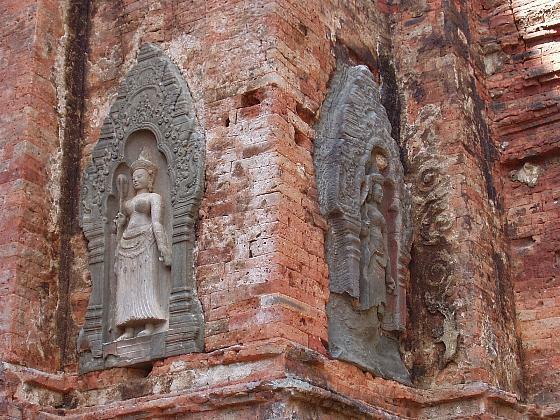 Lolei is noted for its fine carvings & inscriptions which some consider to be the best in this group. Here a worker at the very top is removing some problem vegetation. 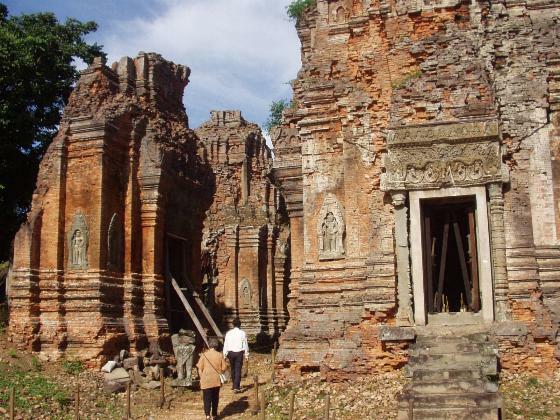 This temple was originally at the center of a man-made lake. Always there were young vendors anxious to sell their treasures. They can be most persistent. 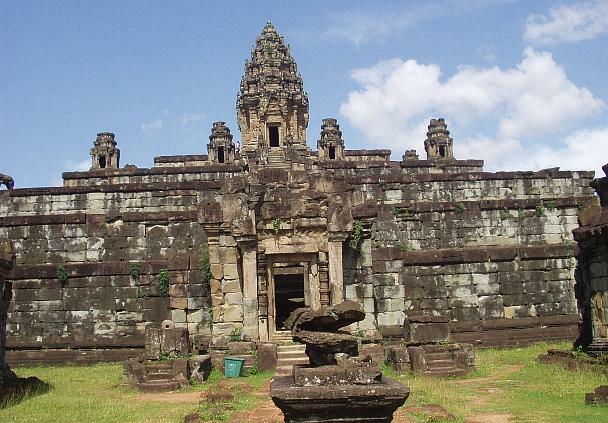 Preah Ko (the "sacred bull") from 879 was the oldest Hindu temple of this Roluos group of three temples. 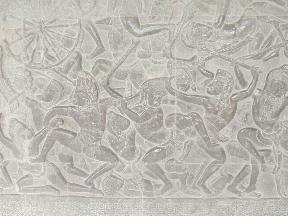 Preah Ko is dedicated to the sacred bull. 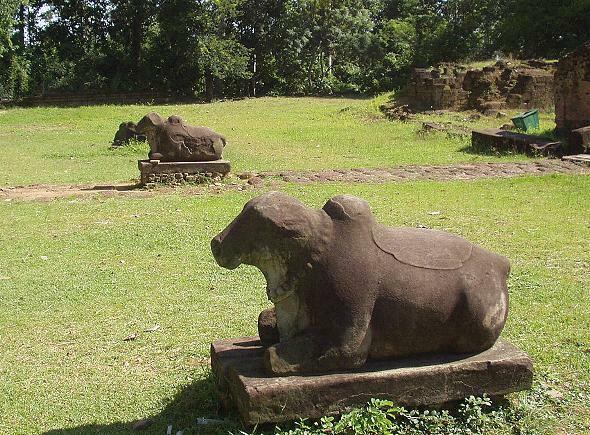 Here are the remains of the 3 nandi ("happy one") which symbolized the white bull of Shiva. 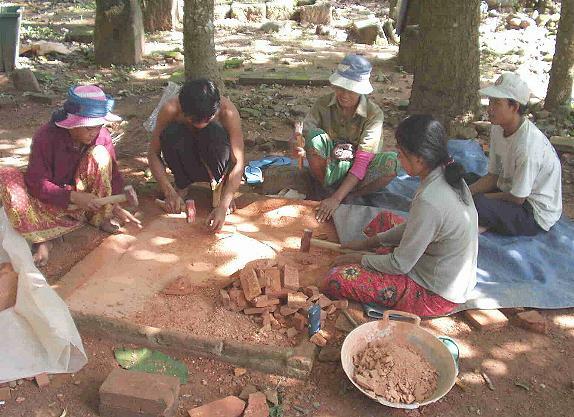 Workers pound dust from local bricks to be used for mortar in restoration projects. 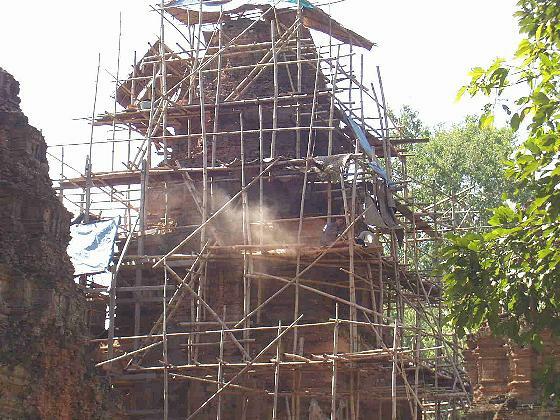 This scaffolding shows the extent of this major restoration project supported by in great part by the German government. 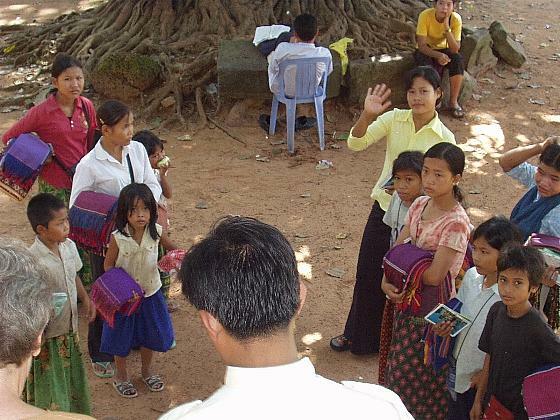 We enter Bakong. Not pictured is the mesmerizing Buddhist chanting & a pond on the right. 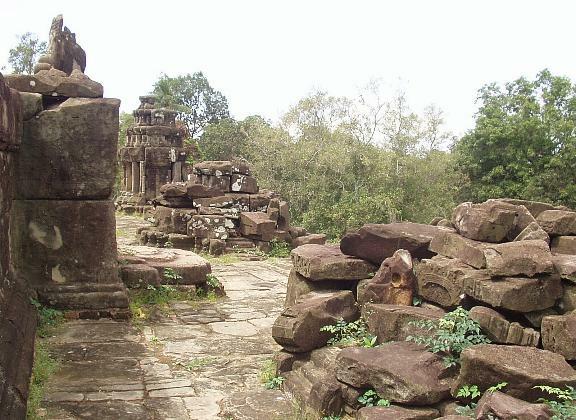 Crouching lions guard the stairs to Bakong of this Roluos group, some 8 miles east of the city. 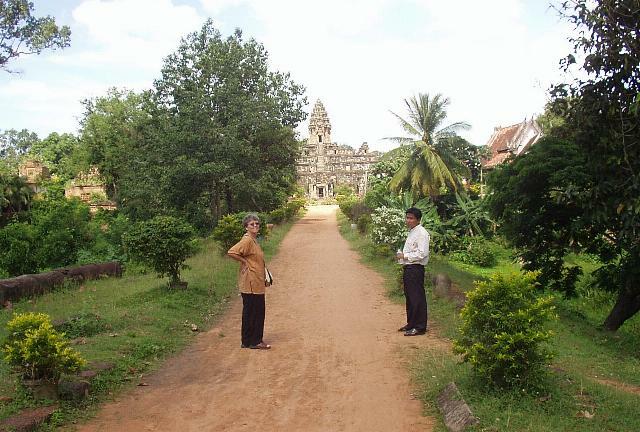 Bakong was once the center of the ancient town that was named from a synthesis of the gods Shiva & Vishnu. 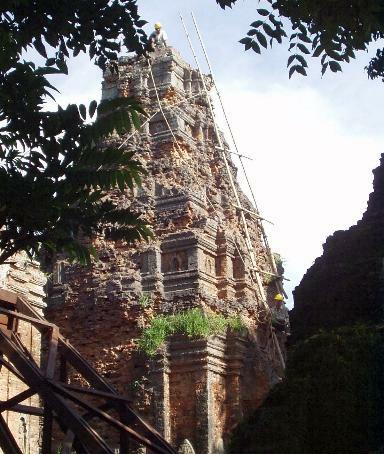 This temple mountain symbolizes the cosmic Mt. Meru. 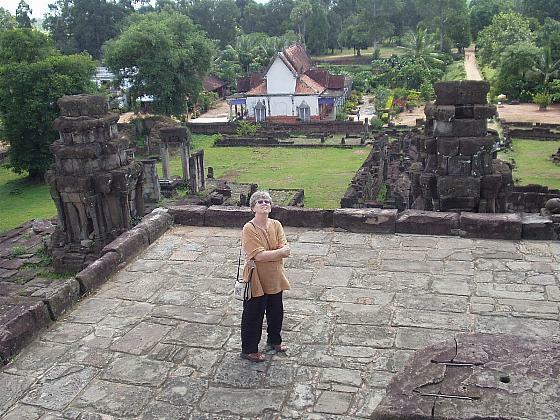 Angkor Wat is visible from this spot where Peg meditates. 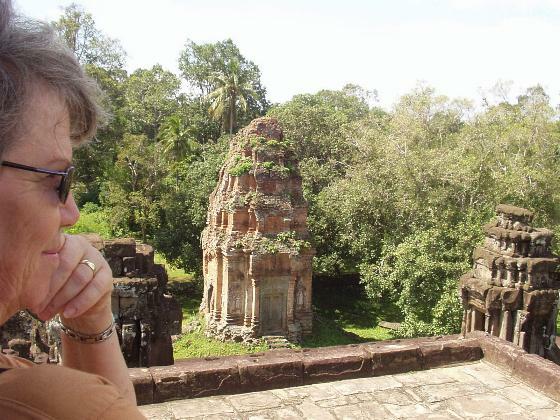 Peg's favorite spot where some structures (sanctuary towers) await rebuilding. 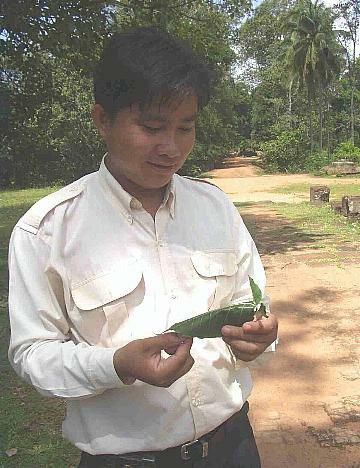 Friend Sopheak shows us a water buffalo fashioned from a leaf -- a childhood activity he fondly remembers. 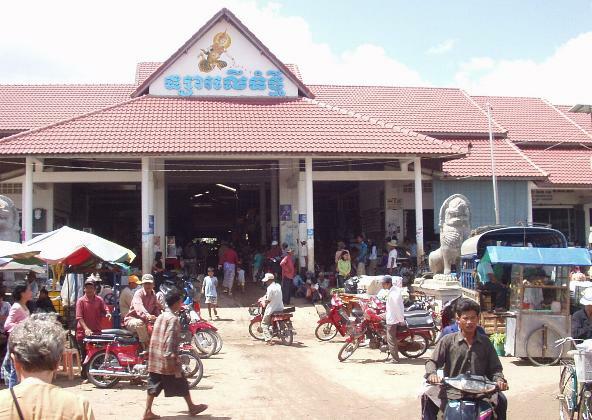 Returning to Seam Reap we visit the market on National Route 6. 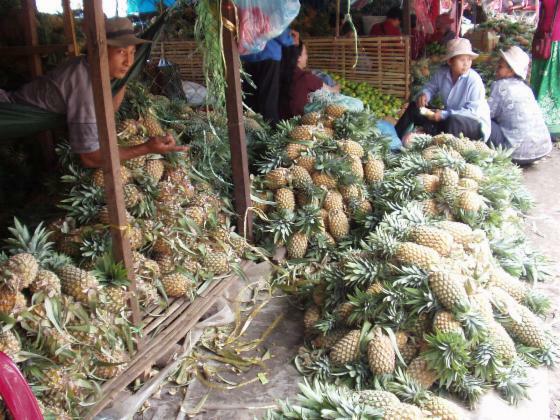 This pineapple vendor has no shortage of this sweet juicy fruit. 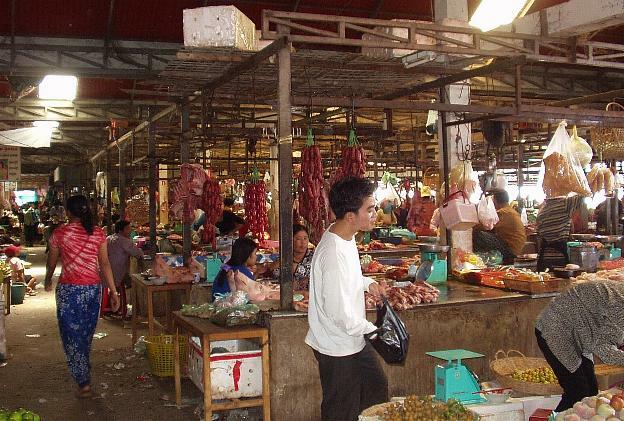 Here a small portion of this huge market features meats and fruits.